Apple Pay will default to using the first credit card or credit card added to an iPhone for purchases, even if you have added multiple cards. 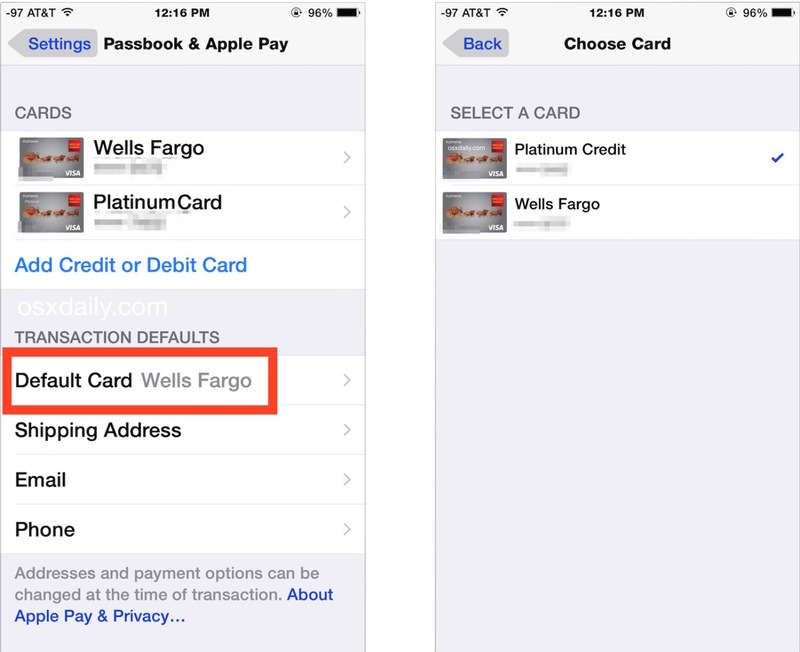 Your first card may not be the account you want to default charges to however, thus some users may wish to change the default card in Apple Pay. Switching the default charge card is a really simple adjustment, but it’s often overlooked because the change is made in the Settings app, and not in Passbook where the cards are actually stored and summoned for purchases. Whatever is shown next to “Default Card” will be the default for Apple Pay transactions made with that iPhone and any synced Apple Watch. 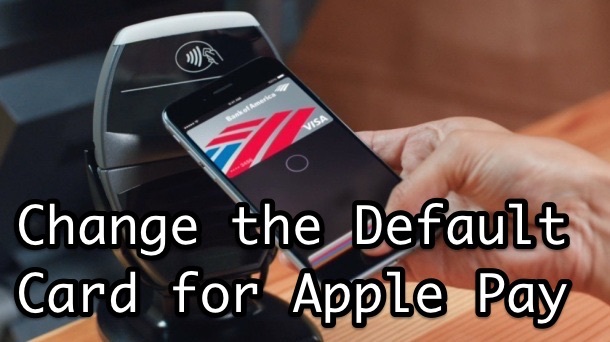 There is no confirmation necessary, as long as the card has already been activated to work with Apple Pay it’s good to go and will be the default charge for future Apple Pay purchases made at stores or online. If you’re not happy with the list, you can always go through the easy process to add a new card to Apple Pay, or remove cards you don’t want on the list too. While you’re in those settings, you may want to check or change the default shipping address, default email address, and default phone number while there as well. Those details are worth at least double-checking on to be sure they’re accurate and things are going where you want them to, particularly if you’ve ever had an Apple purchase shipped to different addresses in the past (like work and home), if you have moved since using Apple Pay, or if you have multiple addresses associated with either the credit and debit cards or an Apple account.